This is not the first time we are writing about Kasautii Zindagii Kay and its extent of 'crazy'. But this time, for a change, we want to be a part of the drama. Probably the most popular show on television currently, Kasautii got down and dirty, as they wrapped up the shoot for the Holi special episode. The entire cast and crew of the show including Hina Khan (Komolika), Erica Fernandez (Prerna), Parth Samthaan (Anurag Basu) and Pooja Banerjee (Nivedita Basu) had a major Holi party on the set and now our Instagram is filled with colours of joy. Hina Khan posted this picture on her Instagram story showing us her tongue that has gone orange from all the colour. Yes, that's how epic this party was. 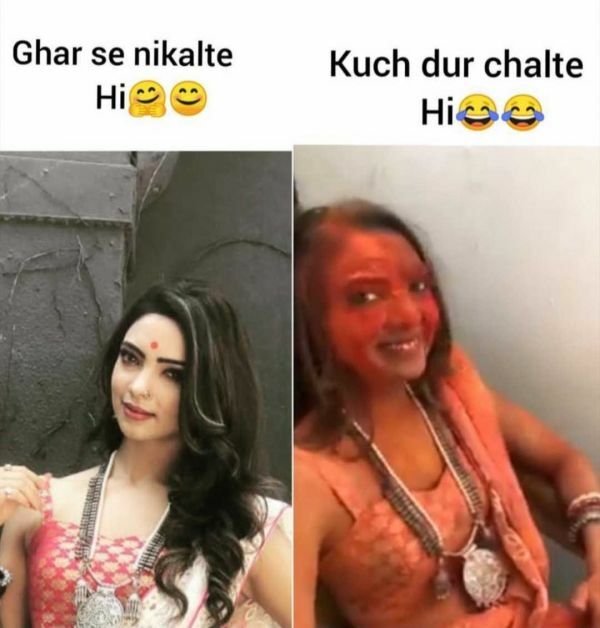 In fact, Pooja Banerjee posted this meme of herself and we can so relate to it! Aww, so cute! Hina wrote, 'You were in your continuity outfit so couldn't attack you, Erica...' and blew a kiss to her co-star. Komolika Is In Attack Mode, Always! Believe it or not, that is Hina Khan running around the set hunting for preys. We almost couldn't recognise her. Anurag Left No Opportunity To Trouble Sister Nivedita! And neither did Prerna. Poor Nivedita. She got dragged into all this mess. Now This Is #KomoSwag At Its Finest. LOL! You may have to flip rotate your screen for this one but it's totally worth it. Served her well, am I right?! If my Holi is even half as amazing as their's, it will be the best Holi of my life! What are your plans this time?